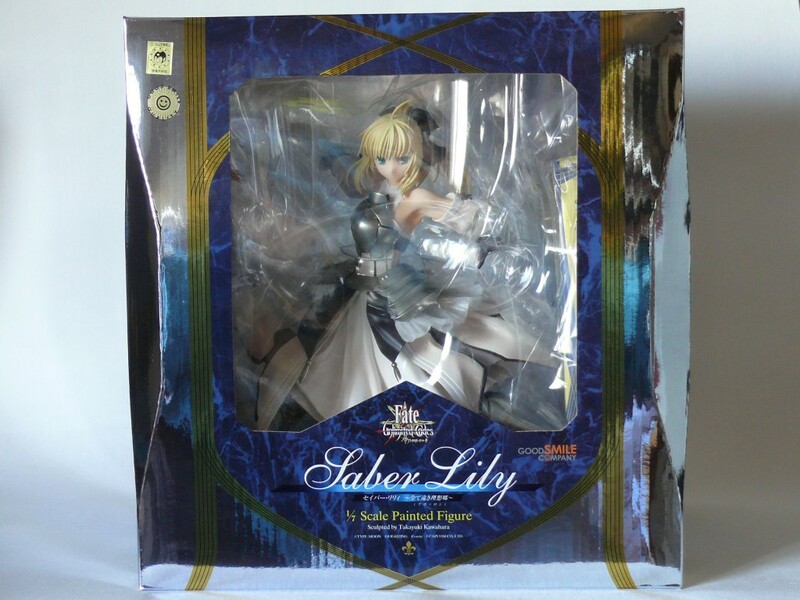 Name: Saber Lily - Distant Avalon. 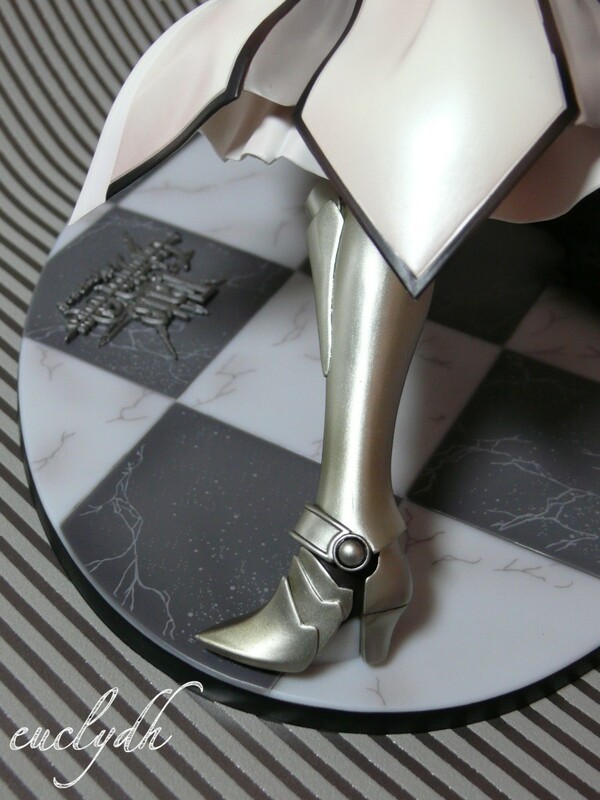 Manufacturer: Good Smile Company (page of the figure). RRP in Europe: 100 Euro. Original: Fate/Unlimited codes (official website). 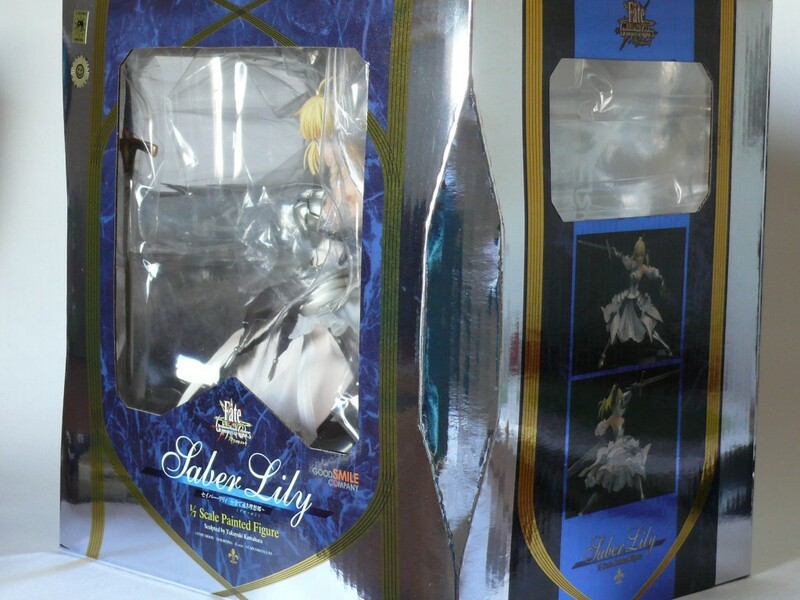 WHERE DOES SABER LILY COME FROM? 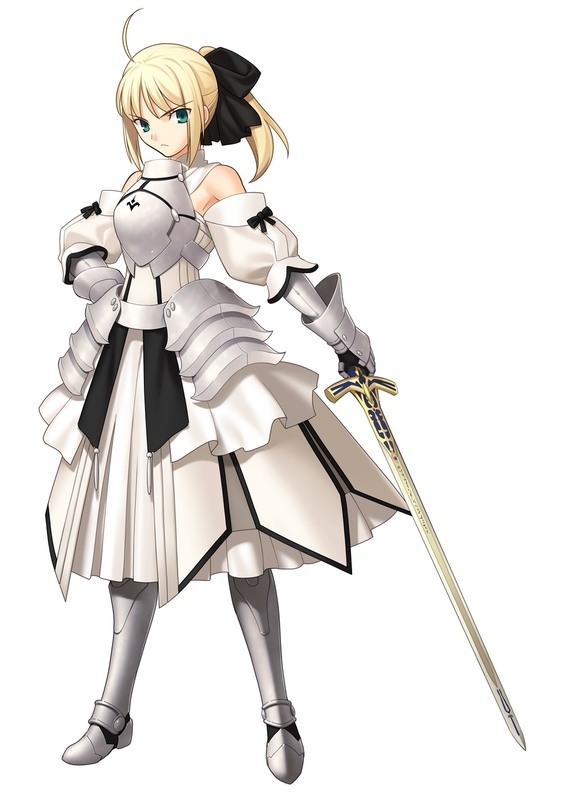 Saber Lily is an extra costume that Capcom made up for the video game Fate/Unlmited Code (I wrote some lines about this game on my blog). If you want to play with her, you will have to unlock her... but don't worry it's easier than unlocking Miku's swimsuit (Hatsune Miku: Project DIVA). 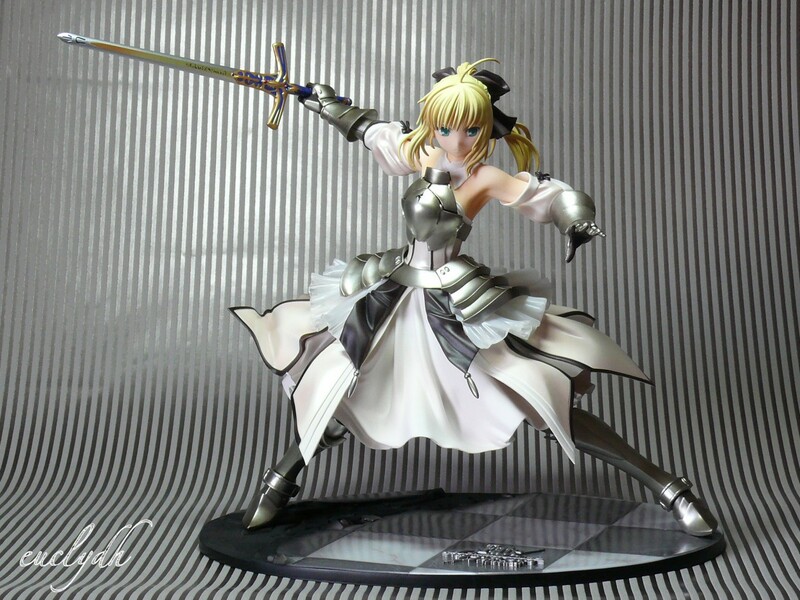 This outfit is really different from the usual armored Saber: we've got the feeling to rediscover the character. According to the name, the design is inspired by a lily: the shape of her dress reminds us the petals of lily. 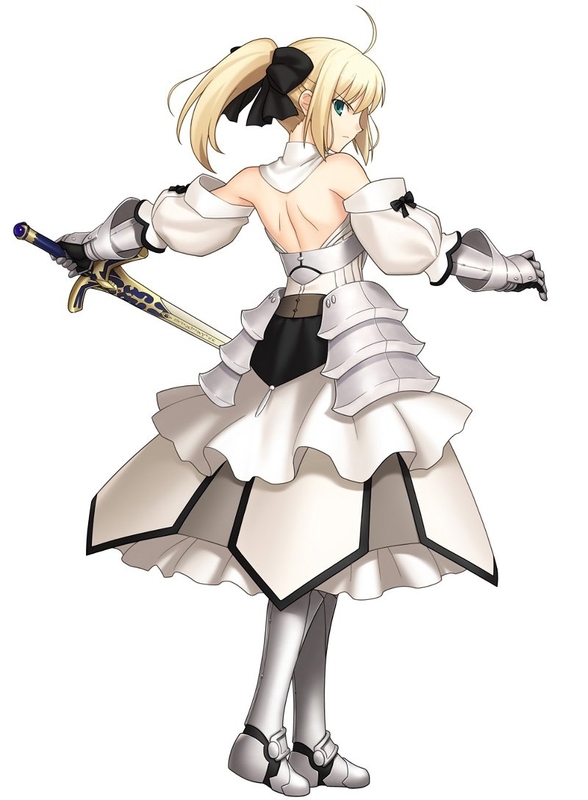 Nonetheless this new version has the same protections as the classical Saber: she wears a breastplate, gauntlets, greaves, and protecting stips that are attached on a waist belt. In fact Avalon is a counter. In fight video games, counters are defensive moves: if you hit your opponent while he/she's doing a counter, you won't lower his/her lifebar... on the contrary, he/she will strikes back. Baiken of Guilty Gear is a good example a such defensive way of playing. 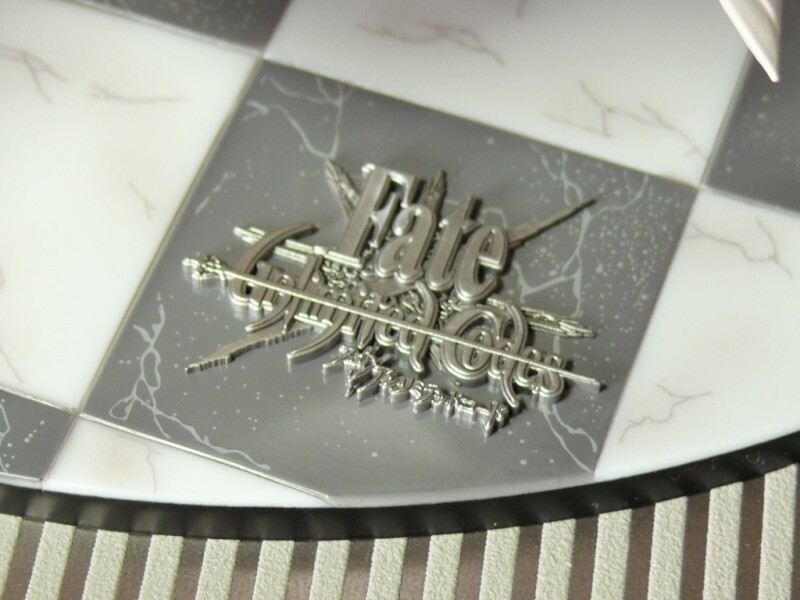 The box is decorated with golden lines that are similar to engraved details on Avalon the scabbard of Excalibur. It has 4 windows: 1 front window, 2 side-windows and 1 above. The main colors are blue and silver. In fact the blue color has been used by the kings in France (the blue color on the French flag should symbolized the kingdom). There is also a Fleur-de-lis under the name written on the front face of the box: the Fleur de Lys was also used by French kings. 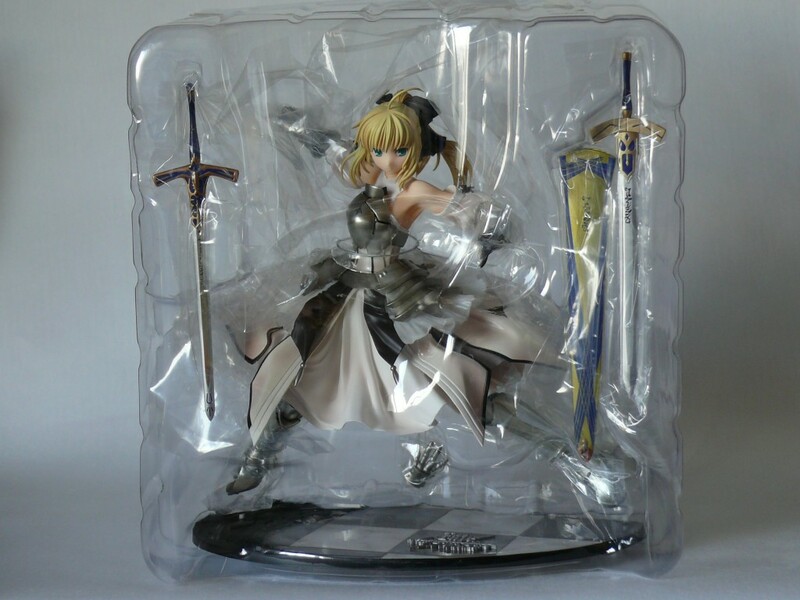 All this details about the kingdom reminded me that Saber is Arturia Pendragon inspired by King Arthur. 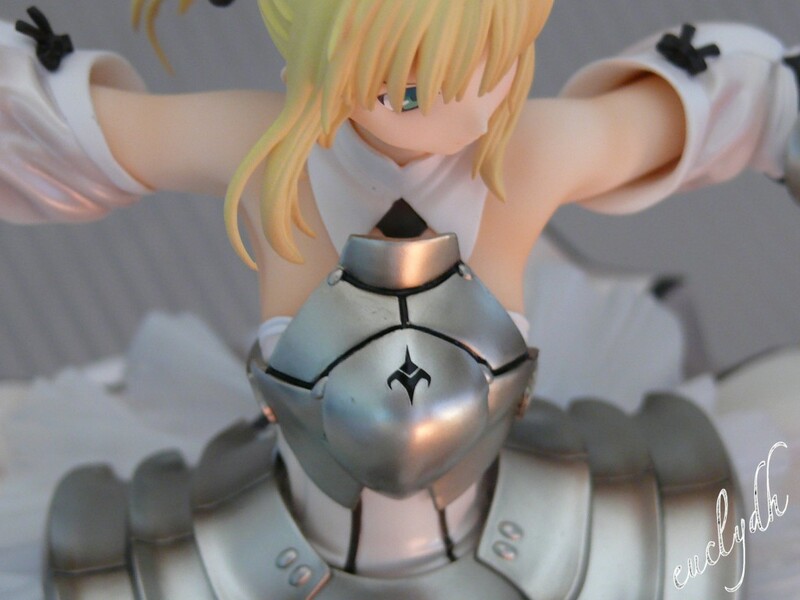 Comparison of the cardboard thickness (Saber Lily vs Nendoroid). - an additional hand to hold Avalon. 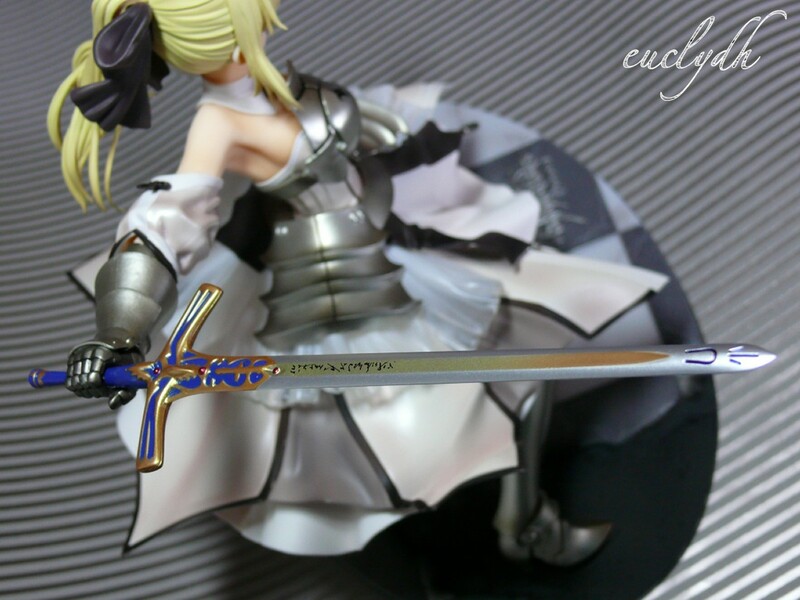 Note that the pommels of both swords can be removed in order to place the hilt in Saber's right hand. Avalon is attached on the additional hand with a square part without any poka yoke: there is 4 possibilities for assembling. 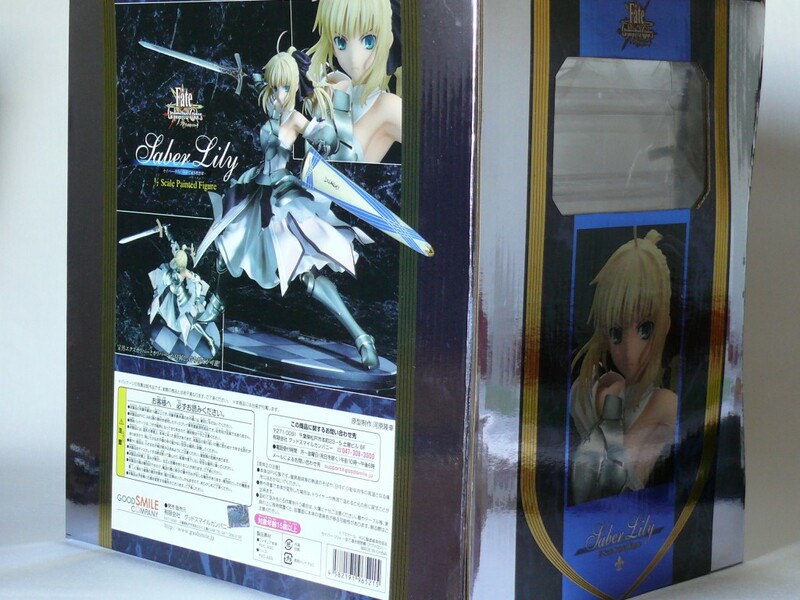 Let's start with the base because Saber can not stand without it, on the contrary to Kallen Bunny girl. 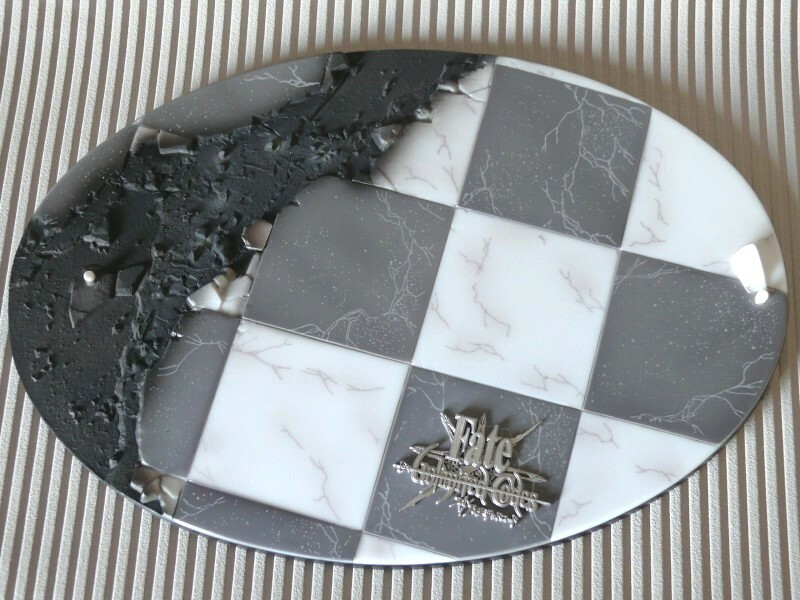 It has an elliptic shape: the lengh of the major axe is about 2a=225mm and the minor's one 2b=155mm... you can right now calculate the area :P The chessboard of the hall of Einzbern castle has been chosen to customize the base: some of parts of the tile start to crack and there is a zone that has been completely burnt... well, Archer and Berserker! Come to fix what you've broken! Excalibur on the left and Caliburn on the right. Avalon can be held vertically. What's on the bill? 5 choices for the right hand and 5 for the left hand. But some choices are incompatible because if Saber has Excalibur in her right hand, Excalibur can not be sheathed in Avalon in the same time... unless doing an astral projection like Prue Halliwell. Number of possibilities n = 5 x 3 + 3 x 2 = 21. Saber earns another 10 for posing. 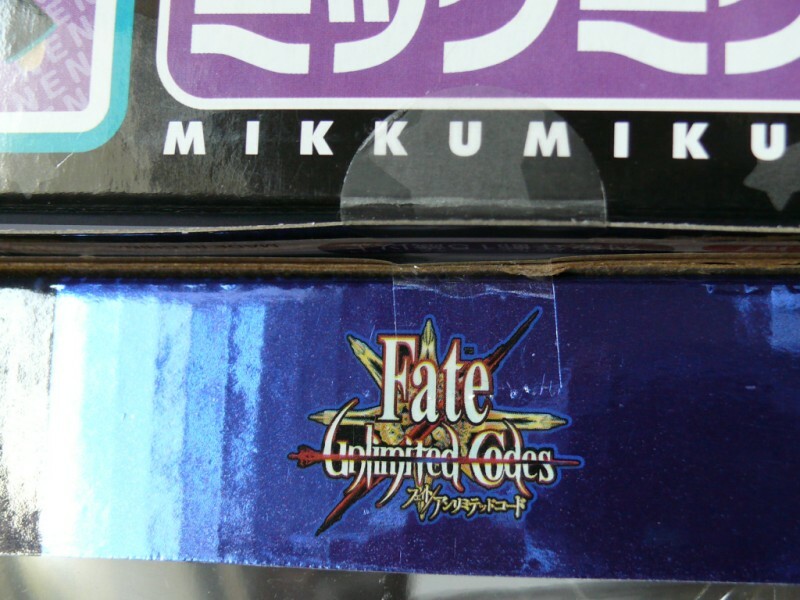 I have thought of holding the scabbard vertically 'cause it is held like this in Fate/UC. 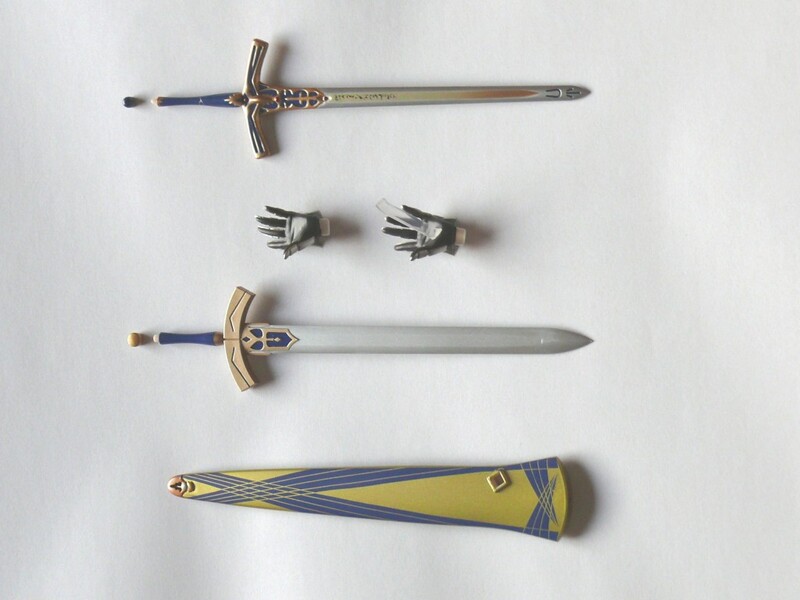 I also like when Avalon is put aside like on the official shots and the "Einzbern Forest" picture above: the sword and the scabbard are lined up. For my part at the beginning, when I saw the pictures of the prototype, I prefered Caliburn in the right hand and nothing in the left hand, because I had a feeling of lightness: Saber looks like very winged. 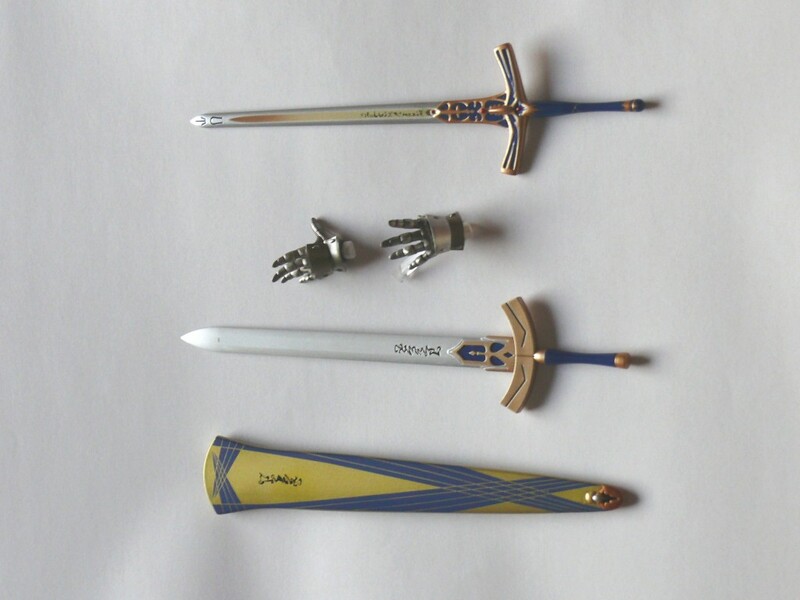 Then after having understood the noble phantasm of F/UC, I guess I prefer Excalibur in the right hand and Avalon in front of the left hand: on the one hand Excalibur is bigger than Caliburn and gives me the feeling the hit will do more damages, and on the other hand, Avalon is used as a shield and not to unsheathe like I thought before. 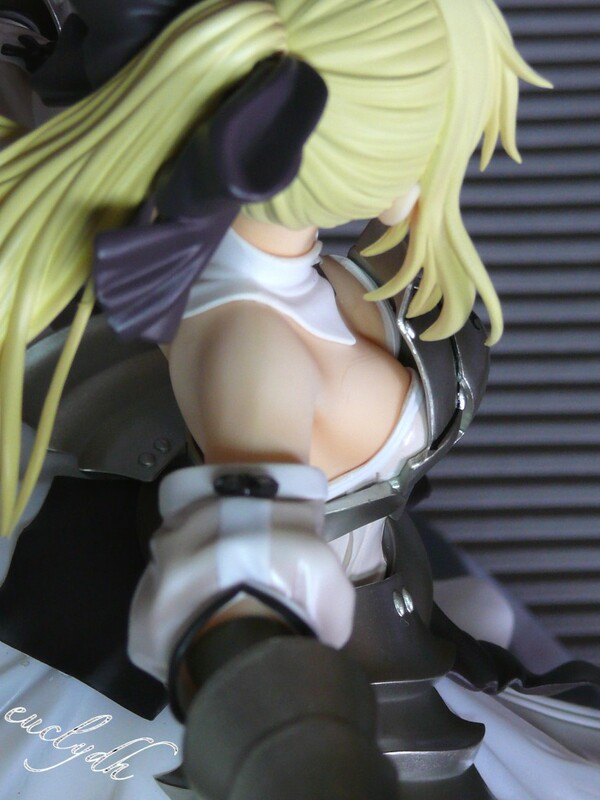 The figure is very detailled :) I took notice of the ahoge, the beautiful green eyes, engraved details on Avalon and the swords... and of course the motif of the master's command spell is on the breastplate. There also are the black knots that tighten the sleeves, etc, etc, etc. The dress is made of 4 real "PVC layers" : a white fabric... kind of underwear, the Lilium dress with petals, a transparent lace and the armor... 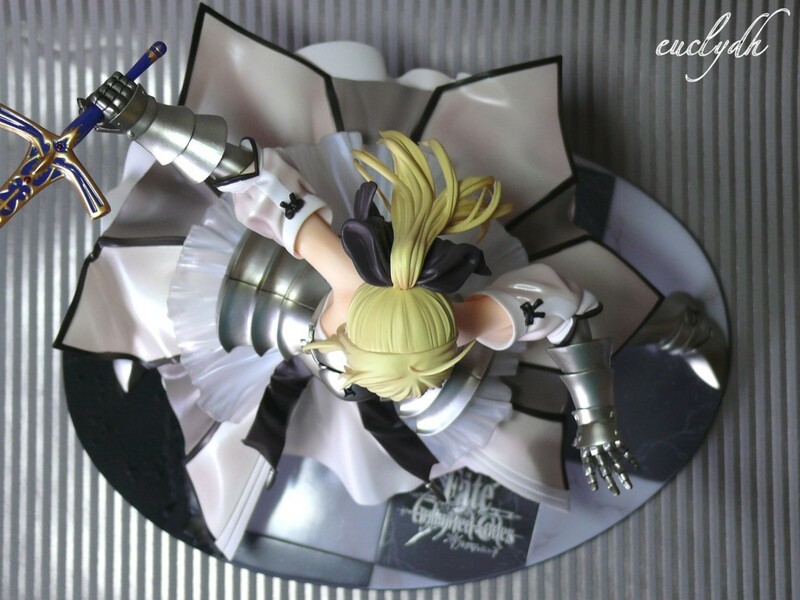 It is very faithful to Saber Lily's design (see artworks above). The sculptor could have, for example, inlayed the lace into the Lilium dress in order to reduce the costs. That's not the case o/ And this outfit has has been sculpted with lot of fabric folds and painted with nice color gradations. It's easier to recognize the Lily flower on a high-angle shot. The gauntlets are well-made: each finger protection looks like made of several metal parts. And the ponytail is gorgeous too: each hair each streak is detailled. It is quite amazing. Little disappointment: there are some marks like if some parts had been rubbed. 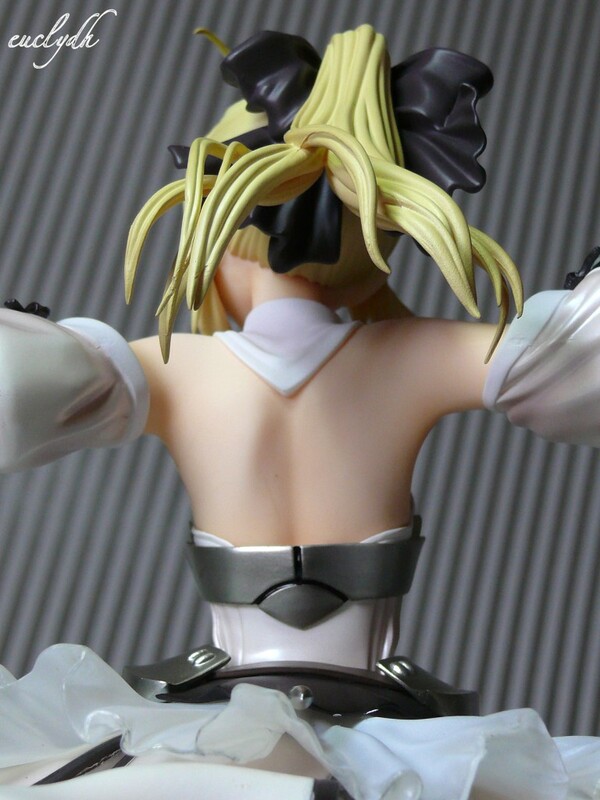 I guess it could be because of the assembling: maybe the operator rubbed the ahoge on the shoulder while he/she was sticking the head on the neck. This marks are not always seeable: it depends on the angle of view. If you read some of my reviews, maybe you noticed that I care about the packaging and the base. For that points I am completely satisfied with what GSC did... I did not have this feelings since the time when I got the Shuraki's figures (once again manufactured by GSC). I tried to imagine what does exactly the machine that folds the cardboard of the box to make the bevel. It's been a while that I wasn't so excited by a figure xD So I am going to give a good score for the "enjoyment" but I am hesitating between 9 and 10: I finally rate 9 because of the price. In fact my only 10/10 rated figure is Akatsuki Mishiro: for me she has a better quality/price ratio than Saber Lily's one. I also created a poll to know what kind of Sword/scabbard configuration people would prefer. You can vote or view the results by clicking right there. GSC published a page to recognize the bootlegs and the genuine figures. Nonetheless that's strange 'cause I didn't see lots of bootlegs. Click here to view this page. AWESOME REVEIW!!! love it, very indepth and detailed. Yeah you're right, there should have been an instructions sheed. Luckily I saw the pics you linked... but for Caliburn I didn't know the pommel was also removable: I realized it when removing Caliburn from the hand because it disassembled. Oh talkin' 'bout Archer, you make me think that GSC should produce one Archer fig... maybe the movie Fate/Stay Night - Unlimited Blade Works (this movie will be released in January 2010) will make them wanna do it ! Anyway that's kind of you for having read this lines about a figure that you are not interested in... but maybe to view it by yourself could change your opinion. The price is subjective : maybe someone who's got lots of money wouldn't have cared about in her/his review. Tsukihi Araragi by GSC : color dilemna.